Caroline is a professional portrait painter, working from her London studio. She completed three intensive years of training in the sight-size technique under Charles Cecil in Florence, Italy followed by a BA in Fine Art. Since returning almost ten years ago, Caroline has been undertaking varied work, receiving many awards. Caroline has had solo shows in London and Brussels, while her work hangs on the walls of private collections around the world. 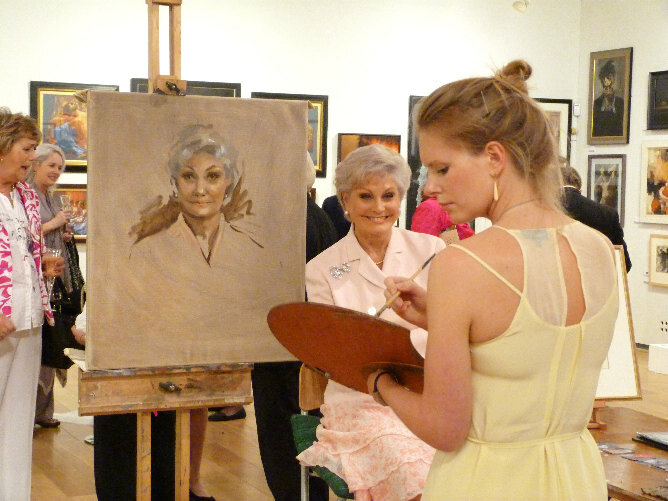 She has sat on the Council for the Society of Women Artists since 2009. Caroline generally works by commission and is well known for achieving life like resemblances, having painted many notable sitters from television reality stars to racing drivers. In 2013 she was commissioned by Halcyon Days to draw Lady Thatcher and in 2012 HM The Queen and HRH Duke of Edinburgh for their Diamond Jubilee Charcoal collection. Caroline also drew the Duke and Duchess of Cambridge for Halcyon Days’ Royal Commemorative Box. A few years ago she painted Lord Michael Grade for an Old Stoic Exhibition at Clarendon Fine Art, Mayfair. Caroline has also painted; Luke Donald, the former world’s number one golfer, for Beaconsfield Golf Club, Angela Rippon for the Lady Taverners, Francis Boulle on ‘Made in Chelsea’ and BTCC racing driver Tom Chilton. Military commissions include Lt Dougie Dalzell, MC (portrait commissioned by the 1st Battalion Coldstream Guards after he was killed in action in 2010 in Afghanistan) followed by a couple of posthumous portraits for the Household Cavalry. After recently living in Italy again and having her first child there, she is once again enjoying London life and is exploring a new area of work - Baby Portraiture. Aside from commissioned work, Caroline has spent the last few years founding and painting large scale life size works for her project ‘WARpaint’, raising funds for charities supporting Service veterans and serving personnel living with the often devastating and life-changing effects of war. This “on-going innovative and vibrant project”, supported by many notable corporate organisations in London and the UK, has raised over £80k so far. For Caroline it has been incredibly rewarding and insightful, meeting people who have had their lives affected, yet often changed for the better, despite their significant injuries. She relishes working on such a scale and telling a story through painting. Caroline's interest in depicting faces from other countries and cultures takes up wall space in her studio too. Travelling widely with her easel and paints, she has a particular love for the colours of Africa, and the warmth of the people she encounters. In the future she plans on painting pieces from a trip last year to Papua New Guinea. - Sue Coombs Portraiture Award 2010, presented by HRH Princess Michael of Kent with SWA.